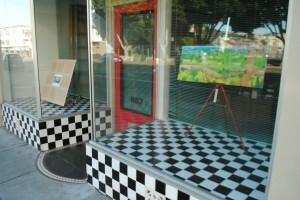 Scott Ellsworth’s windows at 871 Valencia in 2009. On the inside windows, atop the black-and-white checkered tiles of a signless storefront at 871 Valencia Street, architect Scott Ellsworth displays art. Quilt made by 33 and displayed in the window before being raffled off. 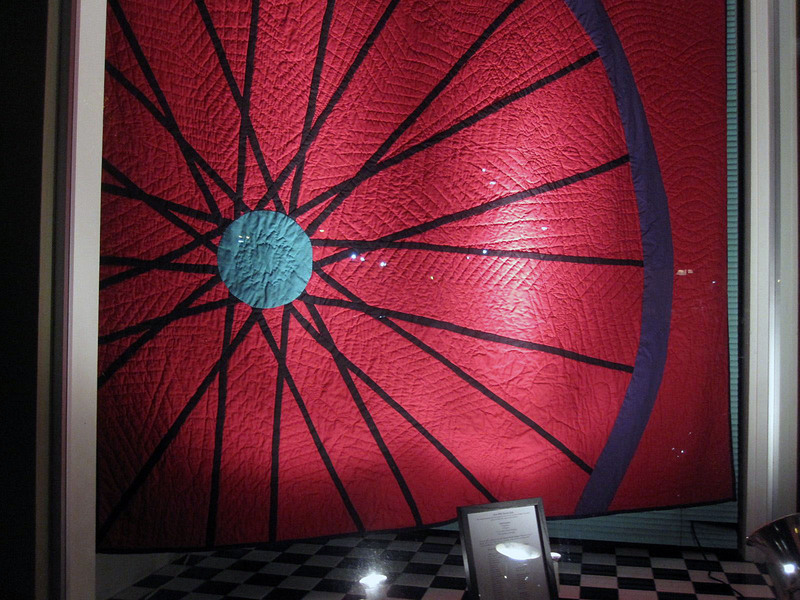 In December, it was an Amish-influenced community bike quilt stitched by 33 volunteers for a raffle. 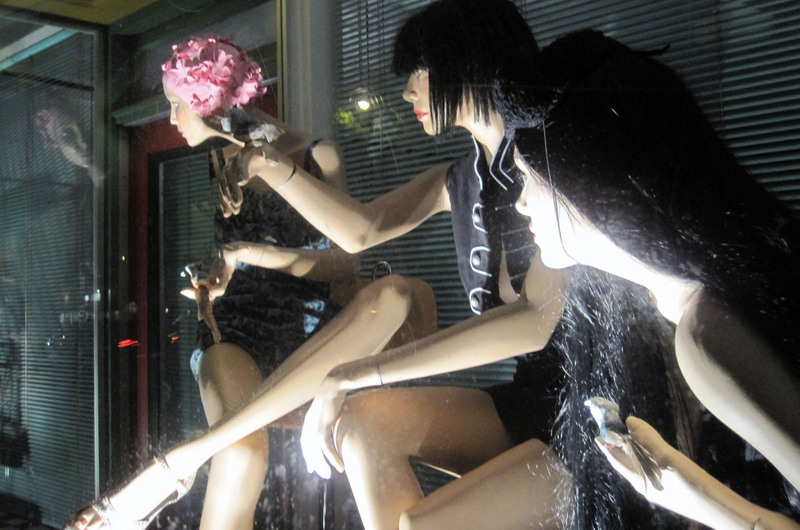 In 2009, local artist Lynn Rubenzer set up a sculpture installation of three mannequins, and Scott Williams, whose murals adorn places like Clarion Alley, landed a show in Los Angeles after somebody saw his stencil paintings in Ellsworth’s windows. The windows call attention to the building, but step inside the red door and you may find that the architect there is the richer story. Sporting round glasses and a fluffy white beard bigger than his head, Ellsworth has owned the building since 1975. In his 36 years on Valencia Street, the architect has watched the neighborhood shift from cheap and full of artists to a place of destination restaurants. At the same time, his business has grown with those changes. He watched the burned-out Jet’s Burgers that sat across the street in an abandoned parking lot turn into a grassy park, which later attracted gangs and was remodeled in 1997 to clean it up. Next to the burger place, at Crystal Pistol in the ’80s, drag queens sang opera on Saturday nights; for the last five years it’s been Range, an upscale restaurant that up until last year had one Michelin star. But unlike other old-timers, Ellsworth doesn’t deplore the changes. “Cities are organic…when you can’t afford the rent, you get shifted around,” he says. And some of the changes have been positive. 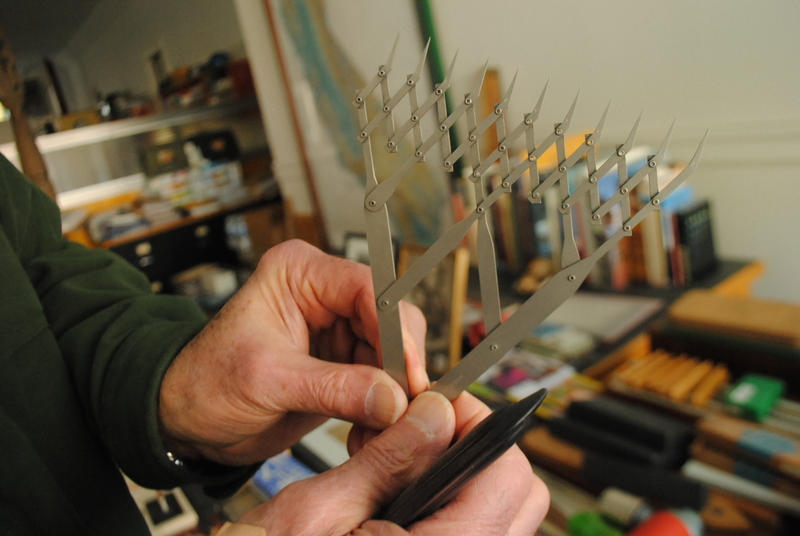 Architect Scott Ellsworth collects antique drafting tools like this one, which divides lines into 10 equal parts. The drug dealing and associated violence across the street has diminished, and Ellsworth says the remodeling of the housing projects down the street brought down the number of robberies. Two controversial city moves, adding bike lanes in 1999 and killing the 26 Valencia bus route in 2009, have made the street less gritty — literally, he says. He’s also an old-timer who has benefited from the changes. He lists by first name the clients he has worked with in the Mission — putting in deli counters at Rhea’s and Valencia Whole Foods, helping design and secure permits for Jay’s Cheesesteaks and its neighbor, Sidewalk Juice, working on Dolores Park Café, Duboce Café and now the new Precita Park Café in Bernal Heights. “It’s work to just get these guys’ businesses growing,” he says. Though he notes the neighborhood is becoming a destination spot and is filled with diners from the “bridge-and-tunnel crowd,” he says there are still places to get a cheap meal: Yamo, the Burmese joint on 18th and Mission, and Valencia Pizza and Pasta on the corner of 19th and Valencia. Although he welcomes the changes he’s watched over the years, Ellsworth still runs his architecture business as he did in the old days. All drafting is done by hand. “I still use all these tools,” he says, holding up a vintage rosewood and stainless steel pencil. He collects antique architecture tools like compasses, scales and ink pens designed to draw two parallel curved lines. The collection now displayed at the front of his office started when an older draftsman gave him an antique pencil. From the table of antiques, looking out the windows through the art display, Ellsworth stops the conversation for a moment. He’s seen a friend, the wife of one of the artists in the window. He goes outside, cups his hands around his mouth, shouts her name and waves. Hadley Robinson trekked westward from a small town in Michigan to answer the call of the Mission. She loves walking out her front door and feeling like every cuisine, cultural event, friend, opportunity and adventure awaits her.